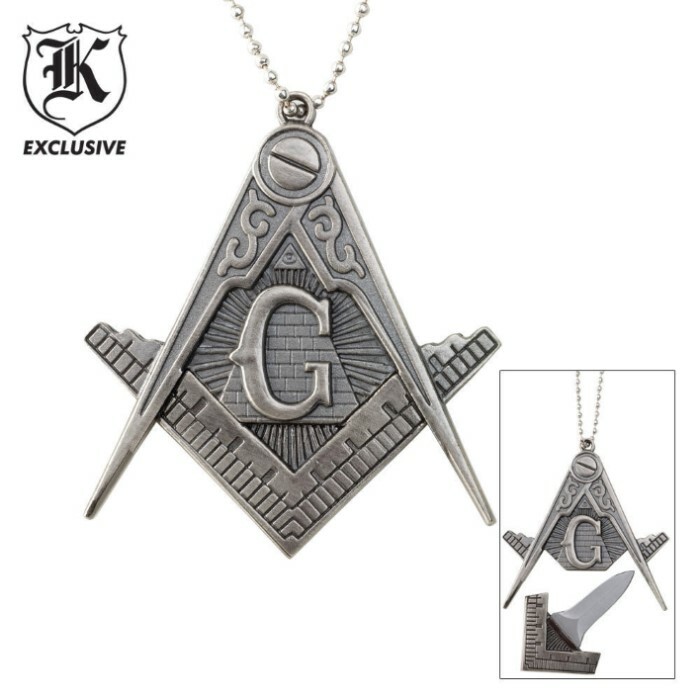 Show your Masonic spirit with this cast metal Masonic pendant that hides another secret. Not only is this double-sided pendant a definite fashion symbol, inside it hides protection in the form of a stainless steel stinger blade. 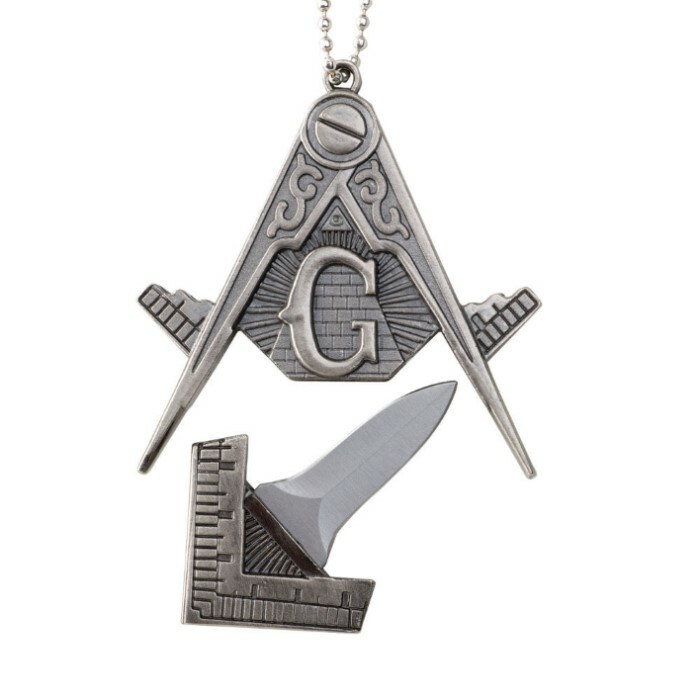 They'll never see it coming when you're wearing this Masonic pendant! This is a very great gift to present newly master masons and to the entire masonic family. I have purchase over 15 of these neck knives and given then as gifts. Where ever i ttravel and my fellow masons see this necklace they immediately asks where they can get them. I must admit I would like to see the blade fit a little tighter when seated. knife falls out way to easily to wear it. only get this if its to be hung on a wall or something. This is a great collector's item at a really low price. The quality of this knife necklace is unbelievably good. Great quality it fits very well with my knife collection. vary good item. really solid, blade came sharp and perfect size. This item is very nice. It makes a rather heavy necklace. However, it makes a wonderful display piece for the Lodge. I do wear mine from time to time and would recommended as a nice addition to any Masonic collection. This is a pretty cool little item, It is a heavy necklace I do not recommend wearing just because of its weight, I am going to mount mine on a nice piece of walnut and give it as a gift. Bigger than I though it would be. Knife is ok. I shorten the chain and hung it from rear view mirror. A great gift for any mason. If the room that this necklace is in is too cold, the metal shrinks and the blade will stay inside when you detach the handle. On top of that, the handle may occasionally slip off and disappear forever, much like mine did. On the good side, this is a rather beautiful necklace and it's an appropriate size. The shipping box has, in big bold letters, "MANSONIC KNIFE NECKLACE." I use spell-check. You should, too. This is great! The necklace is a very good size and the chain length is just perfect for me. Nice detail and the blade stays securely in place. The only negative I have to say is that the blade could be sharper, but hey, that can easily be adjusted.